Journal of an Urbane Gorilla: Whaaaaaat?!? What can I say dear . . .? The phone rang at an ungodly hour this morning. It was the Grams. 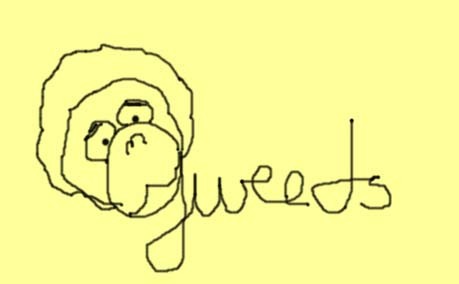 She was whistling, “Happy Days are Here Again.” “Well, Gweeds, did I call it, or did I call it?” “Well, you called me. What time is it?” “Oh, it’s half 9 here,” she chuckled. “Do you realize that it’s only half 6 here?! ?” I replied as tersely as I could. We went through the usual explanations and apologies. She was far too happy for me to point out the obvious: that I was far too sleepy to carry on a coherent conversation. She was all about the election of the day before. What could I say? I can’t even vote here. I asked her how the weather was. “It’s raining cats and dogs, the streets are flooded, but all I can see are rainbows!” There was no sense in telling her that the desert winds have returned to Santa Tourista and that I’m bloody hot, or that I’m worn out from cleaning up after all my cousins. No, this was her day and she was just too happy. She’d better come home soon. She does it all with a very powerful stats program and her own (and other's) analysis of the mood of the electorate. Now I owe her a big dinner. I woke up Thursday morning to the news of a new terror threat. No, it wasn’t Grams threatening to make me ride to work with her on her bike; it was a real threat this time. To say that I don’t understand this stuff would be an understatement. First, why are people who plan to blow up themselves and other people called “martyrs”? A martyr is someone who isn’t pro-active in bringing about his or her death. A martyr is persecuted by others. A martyr doesn’t kill innocent strangers. Second, why did George W. Bush refer the people behind this plot as, “Islamic-Fascists”? Haven’t these people just hijacked Islam for a twisted psycho plot? They’ve used the Muslim faith as cover to commit acts that coulldn't have been what the Prophet meant. Third, what makes them 'Fascists'? Is that just a convenient way to link them somehow with Hitler and Mussolini and the Axis powers of World War II? Is it to make George W. Bush seem more FDR-like? Can we not rise above the political machinations, or is that all that our solons have left in their bag of tricks? Aside from finding ways to identify the un-identifiable, we find ourselves, once again, trying to find logic in something that is illogical to us. I wish I could understand how someone would come to the point where he/she wants to kill for his/her cause. There have always been people who were willing to do this. Each generation gives them another name. At the turn of the last century, they were called anarchists. At the turn of this century, we called them terrorists. But whether we call them anarchists, terrorists, madmen, or fools; they are out there and they want to kill people that they don’t even know. They want to kill people because of an accident of birth. Were you born in an industrialized, secular nation of the west? Then, you are their target. You have a bull’s eye on your back. Were you born a Shi’a in an artificial nation called Iraq? Were you born a Sunni in that same country? Were you born a black African in Darfur? Were you born a Tutsi in Uganda? Were you born in Cambodia? Then, you know what it’s like to have a bull’s eye on your back. It’s impossible to make logic of any of this. It’s like trying to understand the mind of a serial killer. You’ll never bridge that gap. Nor do you want to. Frankly, I don’t want to have empathy for someone who kills with premeditation. I just want them to go somewhere where they can’t hurt anyone. But, they won’t. Hate can grow more intense than any other emotion we're able to muster. Can we laugh with the same intensity? Can we love with the same intensity? Can love or laughter consume us for as long a time as hatred? Why, of all the emotions, are we willing to nurse hatred at our bosoms like a beloved child rather reject it like the snake that it is? I know that you don’t want to sit there shaking in your boots ‘til the end of your days. So, here’s something for you to do. 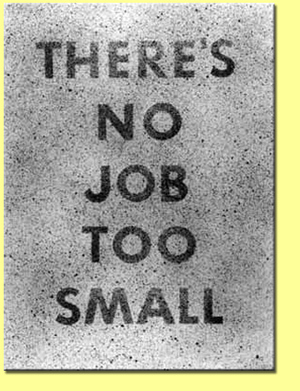 Keep thinking, “there’s no job too small! I can do something right here, right now, that will change the world in a positive way!” Don’t just sit there! Make the world a better place than how you found it. It’s hard to know where to start. The Grams is “under the weather.” Now what is that?!? I don’t understand these euphemisms. Aren’t we all under the weather? We’re not over the weather. Oh, whatever. She’s ill. So, I’m taking care of her in addition to amusing you. Now, I had decided to do a piece on the Little Chef eateries in the UK, but I got temporarily sidetracked. 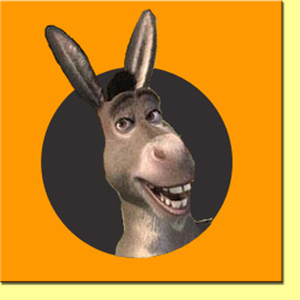 I was Googling the logo for Little Chef and the very disturbing image on the right came up. Now, I’ve heard enthusiastic parents say to babies, “I could just eat you up!” But don’t you think that this was carrying a little too far? Oh well, go figure. 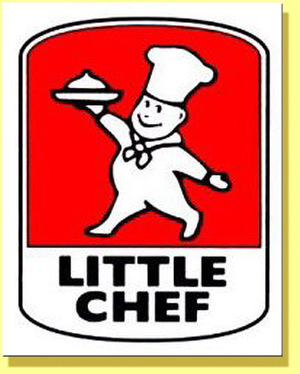 Okay, the Little Chef. These places are the UK version of fast food. If you like English food of days of yore (i.e. heavy, tasteless and swimming in grease); then the Little Chef restaurants are for you. You find them along all the motorways through the UK. 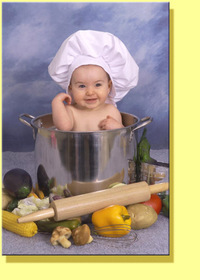 The cute Little Chef himself is too cute. The first time the Grams saw it, she was entranced. But we disabused her of any notion of stopping. It turns out it was just the rotund-ness of the little guy that she liked. That’s why she likes the little Campbell Kids and the Magic Chef logo. She’s got a thing for chubby little chefs. As for the culinary delights of the Little Chef; well, I’ll leave that up to you. The smoked salmon breakfast, I’ve been assured, isn’t too bad. I’d go for the veg breakfast myself. As for anything after breakfast, you're on your own.